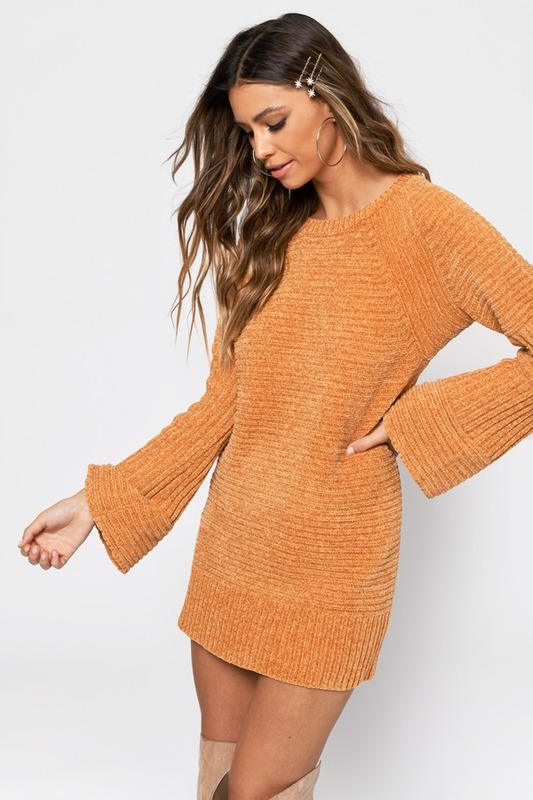 Check out Tobi's Clara Chenille Sweater Dress There's nothing like a cute sweater dress to pull your winter look together in a flash. Introducing the Clara Chenille Mustard Sweater Dress. This short warm winter dress features gorgeous chenille, slightly flared sleeves, a crew neckline, and a comfortable fit. Grab your favorite pair of thigh high boots and you're set. There's nothing like a cute sweater dress to pull your winter look together in a flash. Introducing the Clara Chenille Mustard Sweater Dress. This short warm winter dress features gorgeous chenille, slightly flared sleeves, a crew neckline, and a comfortable fit. Grab your favorite pair of thigh high boots and you're set. There's nothing like a cute sweater dress to pull your winter look together in a flash. Introducing the Clara Chenille Navy Sweater Dress. This short warm winter dress features gorgeous chenille, slightly flared sleeves, a crew neckline, and a comfortable fit. Grab your favorite pair of thigh high boots and you're set. Mustard, Navy modeled on a size Small.